anti-street harassment day | Stop Street Harassment! Thanks for a successful Anti-Street Harassment Day! Yesterday was a Field of Dreams, “if you build it they will come” moment for me as the decision I made on the morning of February 20 to make March 20 International Anti-Street Harassment Day turned out to be so successful. I’m inspired by people’s creativity and passion and I appreciate how many people around the world helped make the day a success by spreading the word and planning action. And actually, a lot of activism is continuing this week. For example, events are taking place tomorrow on campuses in Toronto, Canada, and Delhi, India. Woohoo! It’s great to see events spread out because after all, we know that one day won’t solve this problem. One day won’t even come close. But it’s still valid that March 20 was a starting point for action and dialogue for many people, and a continuing point for many more. Let’s keep that momentum going. Here are ideas for what you can do to address street harassment year-round! And guess what, next year will be even bigger! There were lots of articles and blog posts (and more today from Feministing, Bust Magazine, and Bikya Masr). Twitter was flooded with #AntiStreetHarassmentDay stories, statements, and statistics. And the photos are starting to roll in showing the amazing activism. Here’s a quick round up of feedback I’ve received so far about what went down for Anti-Street Harassment Day! Have a successful Anti-Street Harassment Day! I am SO excited for our big day tomorrow. From people telling their stories to people organizing/attending events, it’s going to be epic. Here is the information you need for a successful day. All the info you need in one place: The main webpage is updated with links to all of this following info. Ten Ideas for Action: Not sure what to do? Visit this page. Find Events: What’s going on near you? Post Fliers and Factsheets: Here are several fliers and factsheets you can adapt, use. I’m excited to say there’s been a lot of media coverage so far. And already the founder of HollaBack Baltimore, Shawna Potter, had an op-ed published this week and male ally Hugo Schwyzer wrote a great article for Jezebel. 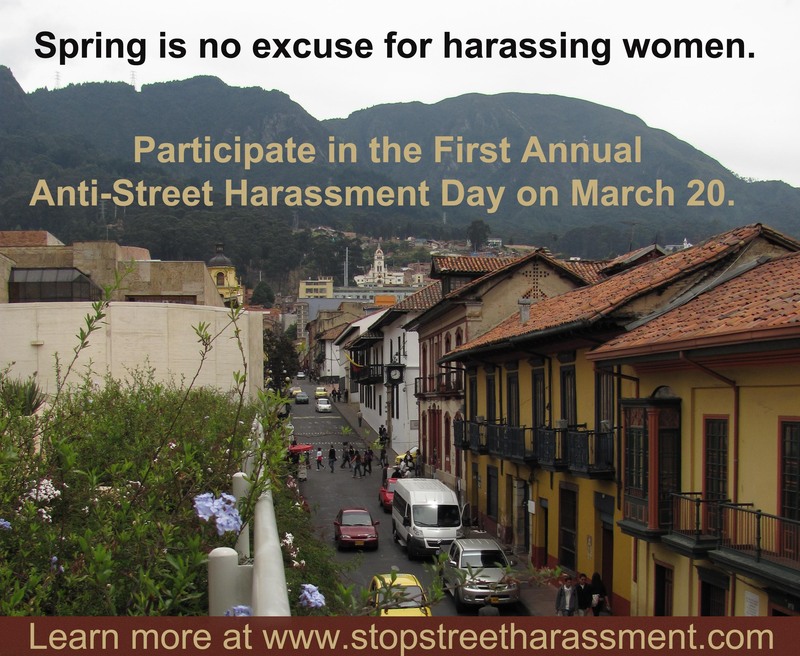 Let’s keep it up and get the message out that spring is no excuse for street harassment. Thank you for taking action tomorrow – I look forward to hearing what you do. WASHINGTON, DC – On March 20, thousands of women and men across the United States and throughout the world in cities such as Cairo, Cape Town, Delhi, London, Mexico City, and Toronto will participate in the first International Anti-Street Harassment Day. Numerous studies show that more than 80 percent of women worldwide face catcalls, groping, stalking, and other forms of gender-based street harassment, especially when they are alone in public. Despite the evidence that street harassment is a global problem and one that reduces women’s mobility and limits their access to resources, it’s often dismissed as a trivial problem, a compliment, or women’s fault. The goals of International Anti-Street Harassment Day are to inspire future initiatives focused on combating street harassment locally and globally and to take us one step closer toward ending the social acceptability of the bullying behavior. Every participant of International Anti-Street Harassment Day will raise awareness about street harassment by sharing their stories online or in person. Hundreds of participants plan to attend community events, hand out materials on their campus or at subway stops, and conduct surveys and audits to better evaluate safety issues for women in their area. In Egypt, in light of recent attention focused on the problem of men harassing women, Harassmap co-founders Rebecca Chiao and Engy Ghozlan are organizing teams of volunteers to walk through their neighborhoods and talk about street harassment with key individuals, like shop keepers and transportation workers. “Our idea is to create safe zones for women … to help change the street’s environment when it comes to sexual harassment acceptability,” Ghozlan said. Individuals interested in participating can find 10 ideas for action at www.stopstreetharassment.com, RSVP on Facebook, tweet using the hashtag #antistreetharassmentday, and look for existing events — or add their own — on CrowdMap. Spring is no excuse for street harassment. Street harassment occurs year-round, but, without fail, each spring the warmer weather and longer daylight hours bring an increase in street harassment. With spring, we see more men congregating in public places, sitting on porches or door stoops, lingering at bus stops or street corners, and driving with their windows down. Too many of these men think it’s okay to whistle, hoot, hollar, follow, and grab the girls and women they see. During spring, Mardi Gras, Spring Break, festivals and parades are all used as excuses for harassing women. I’m all for friendly hellos and mutual, gender-neutral public interactions (that can lead to mutual flirting and hoookups), but spring street harassment is out of control. It is demeaning. It is annoying. It’s sometimes threatening and scary. Evaluating women, making sexually explicit remarks or demands, groping, stalking, public masturbation, persistently asking for a date after being told no, leering, and whistling HAVE GOT TO GO. Too often our stories and experiences with street harassment are silenced, dismissed as trivial annoyances, or portrayed as a compliment. Too few government agencies or elected officials acknowledge this problem or do anything about it. On March 20,you can do something to challenge street harassment and its social acceptability and to let everyone know that street harassment is not okay. Take part in anti-street harassment activities on the same day as women and men all over the country. Let’s remind everyone that spring is no excuse for harassing women. Ten Ideas for What YOU Can Do! You have one month to get ready for International Anti-Street Harassment Day. Whether you decide to do something small or big, know that every action counts and every person can help make a difference. Share your stories to break the silence. Please share a street harassment story with a family member or friend. Share it online. Tweet it using #streetharassment. If you do nothing else, share your story. Respond to Harassers: Use assertive responses, report them, ask them to fill out the Catcaller Form, or hand them an anti-street harassment handout. Hand out or post anti-street harassment information. Print and post fliers, handouts and signs around your neighborhood, office, campus, school, or community center to raise people’s awareness about what street harassment is and why it is unacceptable. (Examples of fliers, posters or signs (click on link for street signs) and another street harassment poster). Hold an event or rally about street harassment in your community or on your campus. Ask people to share street harassment stories and brainstorm how to address it in your community. Show an anti-street harassment documentary. Make it an open mic or art event where people can share their poems or art work on the topic. Hold a self defense demonstration. Conduct a community safety audit in your neighborhood. Build a small team and find out what could make your area safer and more inclusive for women. Take your ideas to your local elected officials. Learn more about street harassment. Watch an anti-street harassment documentary or read an anti-street harassment article or book. Request the Stop Street Harassment book for your library, so anyone in your community can read it for free. Write an op-ed: Write and submit an article or op-ed about street harassment and your experiences with it to a magazine or newspaper. An op-ed that journalist Elizabeth Mendez Berry wrote in the fall of 2010 led to the first ever city council hearing on street harassment in New York City! Survey and map harassment: Survey your friends and family, classmates and coworkers about their experiences with street harassment (you can do so for free with SurveyMonkey). Map where you and they face harassment (google earth offers a free tool to do so with a tutorial) to track any patterns about where it occurs. Take your information and ask the police, elected officials, or local businesses to do something about the harassment in those areas (show them your results when you talk to them). Start campaigning: Organize or participate in an anti-street harassment campaign, like the UK Anti-Street Harassment Campaign and the Don’t be Silent Speak Out Campaign. Ask your elected officials to address this issue. Ask for an anti-street harassment Public Service Announcement campaign. Ask that schools address street harassment in their curriculum. Add your name or organization’s name to the comments if you’re participating. Also, please share what you did for the First Annual International Anti-Street Harassment Day and it will be highlighted on the blog and the Stop Street Harassment website. Share photos! Please contact me if you have questions or need help with any of these ideas. Please add your own ideas to the comments section and we will work to make next year’s even better!